Italy's renowned writing instrument brand is ready to pen down its success story in India with its first flagship store in Mumbai. Montegrappa, Italy’s most iconic pen manufacturer has launched its flagship boutique at Palladium, Mumbai. 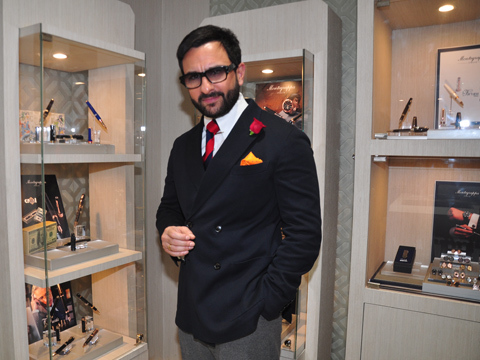 In the presence of Giuseppe Aquila, CEO, Montegrapa, the store was inaugurated by Bollywood actor Saif Ali Khan. Designed with swanky décor and elegant interiors, the store features a wide range of writing instruments, watches, perfumes, cufflinks and leather accessories. It is spread over 350 sq ft of area. “We are pleased to announce the launch of our flagship boutique at Palladium in Mumbai. Montegrappa is Italy’s first manufacturer of luxury writing instruments and has been in the business for over 100 years. The brand is renowned for iconic design that symbolises unique relations and associations with celebrities the world over. We have been active in India since the last 2 years and find high degree of acceptance for Montegrappa products among the true connoisseurs of luxury. The new store will be an amazing opportunity to showcase wide collection of the world’s most luxurious handcrafted pens and accessories with marked Italian craftsmanship,” said Giuseppe Aquila, CEO, Montegrappa Italia. The company is planning to launch around three stores in India in the current year and by 2018 it is targeting to have around six stores across the country. And the price range of its products starts from around Rs 12,000 and it goes upto Rs 8 lakh. Montegrappa was among the first to use celluloid, elevating it to the material of choice for superior pens. The company’s skilled craftsmen were able to perfect the manufacturing process with original and precise technical solutions, which served as the platforms for the artistry of the pens’ designers. Through the ensuing decades, Montegrappa would produce numerous models, now highly collectible. The company has always demonstrated a skill for creating limited edition writing instruments for calligraphers, fastidious collectors and lovers of objets d’art. Having consolidated its position as the premier manufacturer of luxury pens, Montegrappa produces pens commemorating events, locales, historical monuments and individuals. In 2010, racing driver Jean Alesi and actor, writer, and director Sylvester Stallone became shareholders and board members. Sylvester Stallone described as a long-time aficionado and collector of Montegrappa pens is not only the brand ambassador, but also a stakeholder in the company and serves as the face of Montegrappa in its advertising campaigns.